It was said they found a fiber on the knife in our butcher block (a bread knife) that was similar to the screen, but they couldn’t tell us if it was definite. Charles Linch, a trace analyst with Southwestern Institute of Forensic Sciences (SWIFS), received a butcher block with eight knives from the Routier’s kitchen. He examined each knife individually, but found fiber evidence on only the serrated bread knife. After removing those fibers to a microscope, he conducted ten to fifteen test cuts on an identical screen from the Routier’s garage. Each and every time he ended up with fiberglass rods that were in every way microscopically identical to the one recovered from the bread knife. He also ended up with rubber debris with glass particles embedded and a dark pigmentation, all of which were in every way microscopically identical to the debris recovered from the bread knife. Linch looked for other possible sources of fiberglass in the house, such as packaging tape, computer circuit boards, and insulation. The only thing he found was some burned fiberglass in the upstairs fireplace, but it was a very different type of fiberglass from the screen. What made his finding so compelling was the combination of fiberglass rods and rubber material on the bread knife. Davis: Mr. Linch, when you found the fiberglass and the rubbery material on that knife blade and you found the same material in that window screen, did you look at other sources of fiberglass? Linch: Yes. In looking at other sources of fiberglass, I didn’t find the fiberglass in combination with the material (rubber dust particles) that was the same as the screen. On cross-exam, Mosty employed a multi-pronged approach. First, he tried to raise doubt by emphasizing the different amount of each material produced by the test cuts. 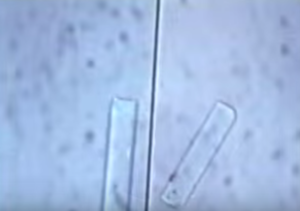 Why was there only one fiberglass rod on the bread knife, but there were 3 or 4 rods when Linch conducted his tests? Mosty: So, in — but the two tests, the rubber dust is similar from the test to the knife, but the fiberglass rods are dissimilar from the test to the knife? Linch: Only in the number found. Mosty: Right. 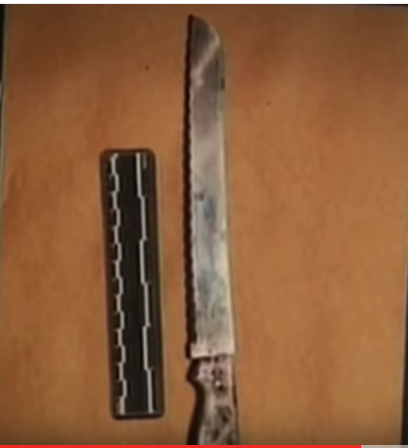 So in that sense the testing was inconsistent with what was found on the knife. Mosty: So you could draw the conclusion that what you found on the screen was inconsistent with your testing? Linch: No. It’s not inconsistent. It’s very consistent. * To clarify, Linch meant that because his test knife went directly from the screen to the examining table, there was less opportunity for any fiberglass rods to fall off. That’s why his test cuts resulted in a few more rods than were found on his initial inspection of the bread knife. The rods were all microscopically identical; only the quantity differed. The State’s theory was that Darlie used the bread knife to cut the screen and then carried it back to the kitchen. In that scenario, some fiberglass rods would fall off the knife as she moved from one room to another. Mosty then turned his attention to the rubber dust particles found on the bread knife. Mosty: And you couldn’t run a test like DNA on that dust? Linch: There is a test that can be done. I wasn’t able to get these things removed to the proper surface in order to do the test. I attempted, but couldn’t do it. Mosty: So there wasn’t even enough to run a scientific test to determine whether or not that was a particular type of rubbery material? Linch: That’s correct. The absolute chemical identification of that rubber dust was not accomplished, because the particles are too minute. Mosty: Ok, and those are the molecular structures that you were not able to observe? Linch: Nobody would be able to. Mosty: I don’t fault you for it. Charles Linch could not ascertain the exact molecular structure of the rubber dust particles (nor could the defense, for that matter), but he did go beyond a simple microscopic comparison. He used polarized light microscopy to confirm that the particles on the knife, as well as the particles on the test cuts, were all synthetic polymers, and that nylons, polyesters, rayons, and acrylics were excluded. In addition, the pigment of the rubber dust material was consistent with the color of the window screen. Note: The fiberglass rod and rubber debris were found within the serration grooves, which is more consistent with the bread knife actually coming in contact with the screen, rather than screen debris somehow finding its way into the butcher block. Both the prosecution and the defense questioned Linch regarding the possibility that the fibers on the bread knife were actually from Charles Hamilton’s fingerprint brush. Davis: Fingerprint brushes, are they also made of fiberglass? Davis: Did you obtain a fiberglass brush from Rowlett? Linch: Yes, from Officer Hamilton. Davis: Alright, did you compare the fiberglass that made up his fingerprint brush with the fiberglass that you found on the knife blade and screen also? Linch: Yes, I did. The fiberglass rods that make up these fingerprint brushes are much bigger than the rods that make up the screen. So they are very, very different. Darlie is grossly misrepresenting what was found on the bread knife. It wasn’t simply “a fiber.” It was a combination of a fiberglass rod, glass particles, and a dark rubbery material unique to the screen. Her claim that “it was not definite” refers to the fact that Charles Linch, or any witness testifying about fiber evidence, for that matter, is prohibited from stating that something is a match. Absent witnessing the actual transfer of a fiber to a surface, no fiber examiner in the world can say that Fiber A conclusively came from Item B. Does that mean the fiber evidence had no value? Of course not. In combination with other circumstantial evidence, it was powerful corroboration that the bread knife from the Routier’s butcher block cut that screen. Darlie’s Writ of Habeas Corpus stated that “defense experts have concluded that the source of the fiber was fingerprint powder used to dust the knives recovered from the Routier’s residence.” To support their claim, the defense cited two sources: Charles Linch’s trial testimony, and his 2002 Affidavit attached to the Writ. Linch testified at trial that when he received the butcher block, neither the block nor the bread knife (knife #4) had been fingerprinted. The knives on either side of the empty slot that had held the butcher knife had been dusted for prints. 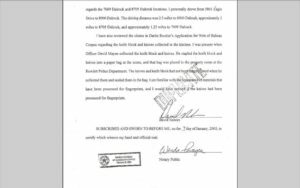 In his Affidavit five years later, however, he stated that all the knives had been dusted for fingerprints before he received them. Linch was simply mistaken in his Affidavit, probably due to the passage of time. His trial testimony is likely to be much more accurate than an Affidavit made 5 years, and probably hundreds of cases, later. It is unclear when the two knives flanking the empty slot were fingerprinted, but it was not done at the crime scene. Charles Hamilton testified to every single item he dusted for prints, and the knives were not among them. The remaining knives, including the bread knife, were not fingerprinted. They were sent to Linch in the trace evidence lab on June 8th. After his testing was completed on June 10th, the butcher block and knives went to the Dallas Sheriff’s lab where Roger Smith dusted them for fingerprints on June 11th. So the rubber dust material Linch found on the bread knife could not possibly have been fingerprint powder. But just for argument’s sake, let’s assume that the bread knife was dusted before Linch received it. First, Darlie’s appellate lawyers would have to prove that the fingerprint powder is consistent with the rubber debris Linch identified. If they passed that hurdle, they would still need to account for the the fiberglass rod. The same fiberglass rod that couldn’t have come from a fingerprint brush.